The Twelve Days of Christmas is a rare song in the pantheon of Christmas music. Most songs follow a certain pattern of a beginning, middle, and end but this song is cumulative meaning each verse builds on the previous one until the end is reached and then counts back down to the beginning to end the tune. It is unclear what the exact origins of the song are or what it was originally meant to mean. Some argue that it was a children’s memory game, which considering how the lyrics are laid out does make sense. It is also suggested French in origin. The song was likely around for quite a while before it was printed in 1780 in a British children’s book called Mirth Without Mischief. It was presented as a memory game for children to play but had no music accompaniment. The song grew in popularity and became part of the English Christmas tradition for many kids. There are some variations that use ten rather than twelve but the most widely accepted version of the song uses twelve days. 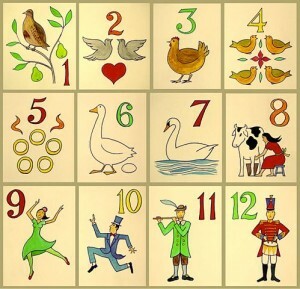 The twelve days are generally from Christmas to Epiphany (Twelfth Day) depending upon when you count it. Most count from Christmas Day but some the day after. Gifts varied in the different versions but the one most people are now familiar with was published in 1909 with composer Frederic Austin fitting the words to the melody heard today. While most people consider the song and the gifts non-religious, there are some who argue the song was used to train children in Catholicism when it was banned in England (1588-1829). There is little evidence to support this claim and it is noted that none of the lyrics indicate anything different between Catholic and Protestant. Most Catholic religious dismiss the notion of it being a tool for Catholic catechism as well. The song is also used as an economic barometer of sorts. Often it used, mostly for fun, to price the gifts to see how they cost in the past and now. Some are a bit tricky to calculate these days but can approximate though pricing ten lords a leaping is a head scratcher for most but the cost of 10 male ballet dancers will fit the bill. There are many popular renditions out there but here is a recent one by country singer Sara Evans and her daughters. Enjoy!